To be honest, I dismissed those little pen drawings called Zentangles at first. After all, it’s just doodling, right? But every time I saw one of these things it fascinated me. I can’t really tell you why except that it looked like fun and the patterns intrigued my eye. And maybe, just maybe I shouldn’t need a reason to explore something that keeps piquing my interest. So when my local quilt shop offered the class I decided to try it. And I’m so glad I did. Besides being just plain fun, it was also satisfying like a really good piece of chocolate. I came home with more than just doodles. I discovered some insights into my creative process. 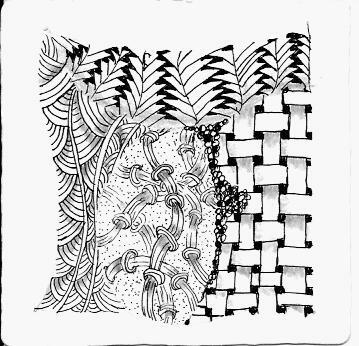 1) Taking a few minutes to do a Zentangle quiets my mind and starts the creative juices flowing. Because it’s quick and not ‘precious’ I can relax and get into “Flow”. My right brain wakes up to play! 1) The “Big Picture” can be overwhelming but when I break it down into smaller chunks and simply start somewhere, it comes together in a magical kind of way. And, in my book, magic is always good when I’m engaged in something creative. 2) It’s enough that something just be fun. Not everything has to be a masterpiece or even be seen by others. To do something just because I enjoy doing it is a gift to my spirit. And the gift lies in the process, not the end product. 3) Simple isn’t always easy. Life has trained me to believe that complicated and BIG is better. Not necessarily so because when I slow down enough to take it one stroke at a time, I can breathe.